This week we have another talented guest blogger joining us to tell us more about buying the right pasta maker. I have been testing some recipes for making homemade gluten free pasta. So this is perfect for our pasta making needs. I hope you'll enjoy the article as much as we did. Often, pasta sold in stores is loaded with preservatives to extend their shelf life. But do you know that homemade pasta is not tastes better; it’s more nutritious and healthier too? We are aware that making your pasta at our home is time-consuming when done entirely by hand; if you invest in a pasta maker you work will be much faster and easier. Besides, you and your family can enjoy fresh pasta without the chemicals and additives, and you can change the flavor and nutrition too, which you can do with ready-made store pasta. Buying a perfect pasta machine will also help you make large batches of pasta of various shapes and sizes quickly for a dinner party or serve in a restaurant or café. For making pasta at home, we recommend you to buy a manual pasta machine rather than an electric pasta machine. Manual pasta makers have and hand-crank on its side that should be operated by hand to roll the pasta dough in the rollers. We are telling to buy a manual pasta machine because it’s easy to operate, cheaper and easier to clean as well. Electric pasta makers are expensive that manual pasta machines and suitable for restaurants where you have to serve a lot of people. But, for making pasta for few 3-4 people at home during the weekends, a manual pasta machine will do the job perfectly. But before that, you should know the main ingredients of pasta. Most pasta is prepared from flour, eggs, and oil. Some pasta recipes have different types of flour, wheat, and semolina. After you mix all the ingredients to create the perfect pasta dough, the dough is passed through a pasta machine to the finished product before cooking. Now, let’s talk what should you be looking to buy the perfect manual pasta machine. Manual pasta machines come various designs, and their cost varies depending on the build materials, features, and country of origin. Make sure the manual pasta machine that you want to purchase has upgradable options to so that you can attach various accessories to extend the functionality of your appliance. Look for a pasta machine with two cutting heads or discs. You can buy additional cutting discs are attach them to your manual pasta maker and make a range of pasta like regular spaghetti, thin spaghetti, macaroni, ravioli, etc. Also, buy a pasta machine with a large bowl so it can hold more pasta as you roll the pasta dough. 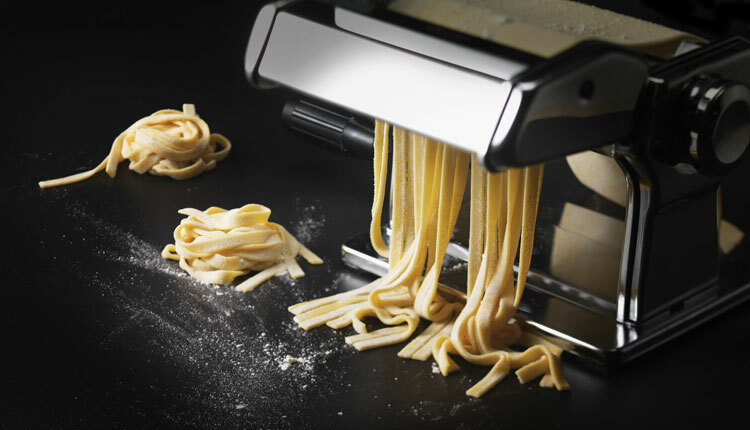 Always purchase a pasta machine that is made from heavier metals, and that can be attached to your kitchen counter. We advise buying a pasta machine made from stainless steel as they last longer and don’t get rusted if not used for a long time. Purchase a pasta maker made in Italy. Why may you ask? Simply, because the most popular and best pasta makers in the world are from Italy. Italian-made pasta machines are more precise and have strict quality controls. It is true Italian pasta machines are expensive that other brands, buy you can buy one cheaper online, and most online stores offer free shipping and longer extended warranties. So, in the longer run, you will save money. And remember, with higher quality pasta machines, you can make great pasta. Finally, a good pasta machine should have a warranty and easy to follow instructions on how to operate and maintain them. Once, you begin and master the art of making various pasta recipes with your pasta machine; you can make fresh, tasty and healthy pasta for your family and friends. Calvin P. Floyd is a well-rounded blogger who has a wide variety of interests and specializes in doing in depth research for every project. He is an expert in doing in depth market research and also a notorious blogger/writer. He provides an absolute commitment to excellence and strides to provide the best quality work possible by all means. He currently is a blogger for http://pastamakerguide.com in a genuine effort to provide the best quality content to his readers.